Walt Disney had the dreams to create his animated movies and themeparks. Roy Disney, his brother, made those dreams happen with his skills in finance. 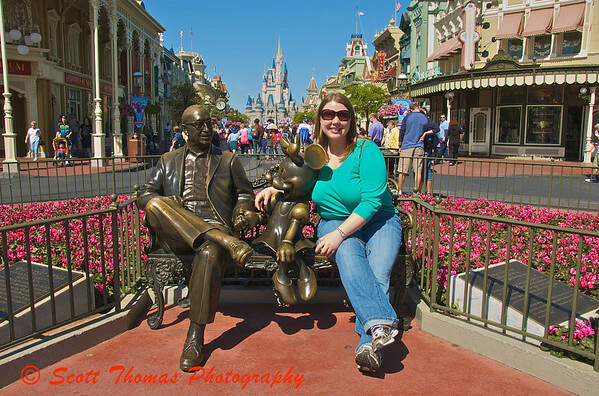 In the Magic Kingdom there is a statue in tribute to Roy where you can sit down with him and Minnie Mouse with Main Street USA and Cinderella Castle as the dreamy backdrop. Sitting with Roy Disney. My daughter sits with Walt Disney's brother and Minnie Mouse in the Magic Kingdom, Walt Disney World, Orlando, Florida. This entry was posted in People, Travel and tagged castle, cinderella, florida, magic kingdom, main street usa, minnie mouse, orlando, Photography, roy disney, Travel, walt disney world. Bookmark the permalink. So jealous…blue skies, sun, Disney – wish I was there!!!!!!!!! Yep, blue skies, sun, warm temperatures…then I had to come back to gray skies and temperatures barely reaching the 10 degree F mark. Brrrrrrr! I am sad that the current Disney ownership has succeeded in wrecking Disney’s dream. But this photo is great. Hmmm….it’s hard to say if Walt’s dream has been wrecked. I think in many ways, Walt would have made the same decisions. Things are a lot different now than they were back in the 60’s when Walt was envisioning Walt Disney World. Is it perfect, no, but for the size and complexity of the place…they have done very well. Yes, Maria, those are sunglasses. A present from her sister, in fact. Thanks for stopping by! Krystal got a good laugh from your comment.